This weekend Taiwan holds elections for the country’s president and vice-president. I don’t know much about politics here; I purposely try to stay neutral (read: uninformed). It’s safer that way. I figure: whatever this country is doing seems to be working. The enthusiasm of the Taiwanese for voting is epic. Folks literally fly BACK to this little island from all over the world just to vote. No absentee ballots. Then there are the banners. No little ugly plastic rectangles stuck into all of your neighbor’s lawns. No. These banners are colorful 6′ tall flags on even taller poles bearing the beaming faces of the candidates, spaced evenly along the street medians along with the national flag. And get this, Taiwan’s president may soon be a WOMAN. No kidding. 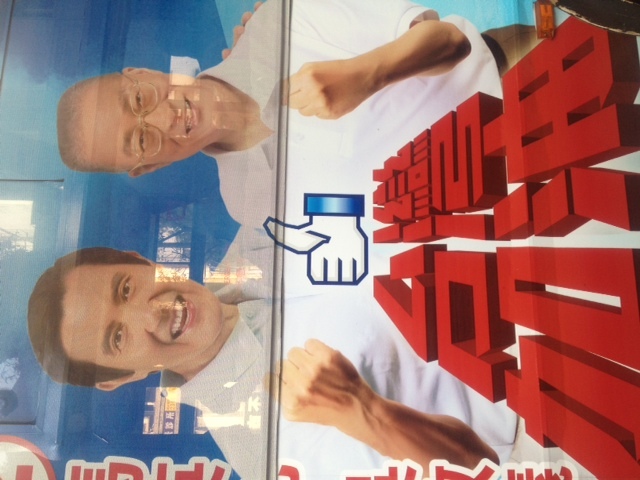 Busses and MRT cars all over Taipei (and presumably all over Taiwan) carry photos of all three partys’ candidate pairs, smiling with fists clenched, held high, in apparently victory. Small trucks, draped with giant banners of one set of candidate likenesses, slowly troll the streets, sharing the candidate’s canned thoughts via loudspeaker. The Taiwanese are so mannerly, I doubt any of the potential presidents mount any type of “dirty” campaign. I know that one party is called the “blue” party and one is the “green”. One is pro-unification (with China) and one is for independance – but I don’t know which is which. And I don’t know what the third party is….Happy voting Taiwan!